At this point, it is no secret that the biggest question mark for the Ducks as they head toward the 2015-16 season is who will be under center come September 5th. But when considering recent history, we already have the answer: the starting quarterback for the Oregon Ducks this season is Vernon Adams, Jr.
Quarterback Jeff Lockie getting loose during pregame warm-ups. In some ways this is unfortunate, because you want to root for a guy such as Jeff Lockie, a guy who has done everything right. A guy who has patiently waited for the last three years behind the best quarterback in college football, instead of taking the easy way out and transferring. A guy who has worked his tail off for this University without a lot of credit, and has handled this whole starting quarterback situation with class and respect. But football games and position battles cannot be won with class and respect alone. It requires talent, and Adams is a more talented quarterback than Lockie. Not to mention this would not be the first time that the “heir apparent” quarterback gets beaten out by a dark horse competitor on the Duck depth chart. You can go all the way back to the 2007 season when Dennis Dixon was wrapping up his Heisman-worthy senior campaign for the Ducks. Upon his departure to the NFL, two quarterbacks were left to battle it out for his starting spot, Justin Roper and Brady Leaf. But who won the starting job come 2008? Roper? Leaf? Both quarterbacks, among others, were beaten out by JUCO transfer Jeremiah Masoli, who started out fall camp as the 5th-string quarterback before battling his way to the top. Two years later when the Masoli era came to an end after the 2009 season, all signs pointed to the experienced veteran, senior Nate Costa, to take over the staring spot come 2010. But who wound up starting for the Ducks that year? The more explosive redshirt sophomore Darron Thomas. Bryan Bennett running in the open field during his first career start. And again in 2012, after Thomas (somewhat surprisingly) left for the NFL Draft, 2nd-string quarterback Bryan Bennett was the favorite for the starting job. Bennett had even started a game for the Ducks in 2011, leading them to victory against the Colorado Buffalos in place of the injured Thomas. Even with this valuable in-game experience and a 1-0 record as a starter, he was beaten out by a redshirt freshman from Hawaii named Marcus Mariota, who had never attempted a collegiate pass. 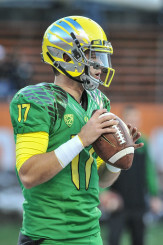 The spring game was able to shed some light on the Ducks current quarterback situation. We learned that Lockie can accurately hit wide-open receivers in space, but lacks elite arm strength and the dynamic play-making ability that Oregon fans and coaches alike have come to expect from the quarterback position. Outside of Lockie, we learned that wide receiver Bralon Addison is probably the second- or third-best quarterback on the roster as the group of underclassmen QBs generally underperformed with a collective 40% completion percentage in the spring game. What Adams brings to the table is something that no other quarterback on the current roster has: more than 10,000 passing yards, a 110-31 touchdown-interception ratio, more than 1,200 rushing yards and 11 rushing touchdowns. Not only are there no quarterbacks on the Ducks roster who have this kind of resume, there are few quarterbacks in the country that can match his illustrious resume. Bralon Addison turning the edge against UCLA. 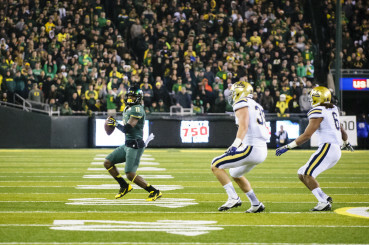 You must also factor in his ability to throw an accurate deep ball, which is crucial for the Ducks in 2015 – considering this may be the most talented wide receiving corps the Ducks have ever had with the return of Addison and 2014 standouts Byron Marshall, Devon Allen, Dwayne Stanford and Darren Carrington III. 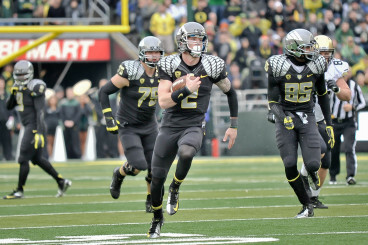 The last three times the Oregon Ducks had a change at the starting quarterback positiion, the quarterback who was more “familiar with the offense” was beaten out by the more talented and explosive alternative. 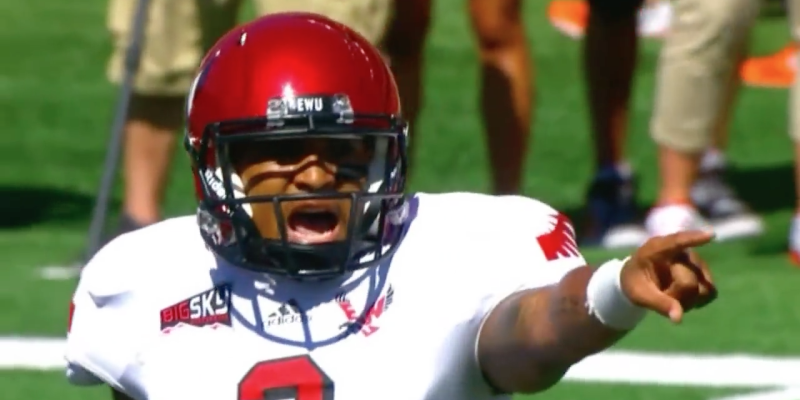 And with Vernon Adams’ arrival after his graduation from Eastern Washington University in June, he is going to push that streak to four. The 2015 Ducks team is loaded with top-end talent. They are a team that is ready to win — now. When it comes down to who should be the starting quarterback, there is only one thing that matters: which quarterback gives the Ducks the better chance to win the national title next year? It is, without doubt, Vernon Adams, Jr.
Dennis DixonJeff LockieOregon DucksOregon FootballQuarterback battleVernon Adams Jr.